Lou Jones is a photographer, social documentarian, author and mentor. He has completed assignments in 49 countries and 48 out of the 50 United States, photographing royalty and the third world, the sacred and profane. He has worked with institutions like Amnesty International, the Unitarian Universalist Service Committee, the American Friends Service Committee, the Massachusetts Association for the Blind, and the Barr Foundation. He has photographed Miles Davis, Willie Mays and Roger Clemens, Orson Welles and Matt Damon, twelve Olympic Games, Queen Elizabeth, and inmates on death row. He is the author of five books: Final Exposure: Portraits from Death Row, Northeastern University Press, Boston, Massachusetts, 1996; Travel and Photography: Off the Charts, Focal Press/Elsevier, Burlington, MA/Oxford, UK, 2006; Exiled Voices: Portals of Discovery, New England College Press, Henniker, New Hampshire, 2008; Speedlights and Speedlites: Creative Flash Photography at Lightspeed, Focal Press/Elsevier, Burlington, MA/Oxford, UK, 2009; St. Petersburg, Russia, Blurb, 2010. 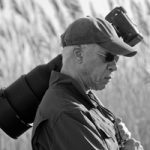 He has received numerous awards such as the Professional Photographers Leadership Award from the International Photographic Council (United Nations), and the CONTACT award from the Boston Photography Collaborative. He was a Travel Photographer of the Year finalist. His first book, Final Exposure: Portraits from Death Row, chronicled his six-year odyssey documenting men and women on death rows in the USA. For this he received the Ehrmann Award from the Massachusetts Citizens against the Death Penalty. His most recent photography book, Saint Petersburg Russia, was recently nominated for Blurb’s 2011 Photography Book Now People’s Choice Award. His work has been exhibited in schools such as Harvard, Phillips Exeter Academy, Texas Tech University, with major shows in collections at the Smithsonian Institute, San Francisco Museum of Modern Art, the DeCordova Museum, and the Center for Fine Art Photography.